Shred Nations has been providing mobile shredding services and offsite shredding services to corporations and businesses nationwide for decades—we know how to help your business with your shredding needs. We can help you find a reliable, secure shredding provider in your area that can schedule a one-time purge or ongoing service for whichever time-frame you require. Hiring a secure shredding service will ensure that your documents are shredded quickly and efficiently, streamlining your document shredding management plan and reducing the chance of a data breach due to inefficient or in-house shredding. We also offer detailed information on Electronic Media Destruction and Hard Drive Shredding—a service that businesses use to ensure their digitally stored information is securely disposed of when they retire a computer or other office equipment from use. 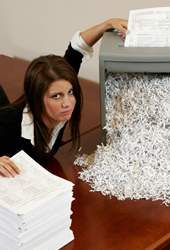 Learn about the advantages of hiring a secure shredding service for your business. From business document retention times to shredding policy and procedures, we’ll provide you with detailed information on what’s best for your business. Protect your information by properly disposing of your hard drives and retired office equipment. We’ll discuss the different ways to destroy electronic media and hard drives, and what it takes to ensure your data is protected. To get started, fill out the form to the right, or give us a call at (800) 747-3365 for a free, no-obligation shredding quotes within minutes.